New collection of the best posts from the best birding blogs in the world is up at The Greenbelt at the sixty-third (!) edition of I and the Bird. Many birders, myself included, have driven long distances in search of a certain bird or spot but been foiled by a lack of precise directions. Local birding information is gold to a traveling birder, but it's hard to find (unfortunately, even the most willing gas station employee will usually not have an answer when you ask him 'Which tree do the crossbills hang out in?'). That's why everyone birding in Maine owes a 'thank you' to Bob Duchesne and the Maine Birding Trail. The site breaks the state into 14 sections and gives precise directions to important birding spots with information on the best times to go the the species to expect. The MBT contains some of the only information on the web about lesser-birded parts of the state. The "Western Mountains" section has personally saved me lots of time driving backwoods log-roads in search of boreal birds. I interviewed Bob (who, in addition to being a great birder, is a State Representative and is enshrined in the Country Music Disc Jockey Hall of Fame) aboutthe Maine Birding Trail and all that he had to do to complete it. How did the idea for the Maine Birding Trail come about? devote some of my spare time to getting the project off the ground. time. So I just did it all myself. Hmm...having to work all by yourself doesn't sound so bad when that work is "traveling all over the state looking for birds," but I'm sure there's much more involved. What kind of things does one have to do to create a state birding trail? BD: Nope. Doesn't sound bad at all, does it? Unless, you consider that I've put enough miles on my car to drive around the world...at up to $3/gallon for gas. Plus attended zillions of meetings without birding, and spent my own money on printed material and web site development. It's no good having a trail if I'm the only one who knows about it. About half the states in America have some form of birding trail now, and each one has its own story of how it came together. Only a handful are the result of motivated individuals. Most are done (and funded) by the state, by the federal government, by grants, by state Audubons, or some other source of money. Site offers an abundance, diversity or richness of bird species and other natural attractions. Site is on publicly accessible property. Site is safe under normal and reasonable usage. Site designation is endorsed by its ownership/stewardship authority. Site designation is endorsed by local Maine Audubon chapter and/or similar local stakeholders. Site has sufficient parking and access to handle increased visitation. Site has ample and interested tourism support nearby, including lodging and dining. Increased visitation will not threaten sensitive habitat or species. Increased visitation will not cause undue financial burden to ownership/stewardship authority. Ha Great, I know for a fact that birders appreciate not getting killed. So how did it work? You broke the trail (and the state) into regions, but did you work one region at a time or work some other way? great birding spots around there. Western Maine was the last to be drafted. marginal ones will be dropped. remote and more frequently-birded areas? Another pleasant surprise was the Kennebec Highlands land trust trails. They are short, easy, scenic, and birdy. In southern areas that are well described, I would say Brownfield Bog, Reid State Park, and Kennebunk Plains never fail to please. In Washington County, Quoddy Head State Park is always a winner. The Orono Bog Walk in Bangor is world class. Road, Long Falls Dam Road. Cape May Warbler: Evergreen Cemetery in Portland during migration; anywhere in the boreal areas around Moosehead Lake. trails; Boot Head trail in Lubec. Leach's Storm Petrel: off the whale watch boat in Bar Harbor in August. Grafton Notch State Park. Second choice: the Roaring Brook campground parking lot in Baxter State Park. Third choice: two miles up the Caribou Pond Road just north of Sugarloaf USA. Northern Goshawk: Baxter State Park; Moosehorn NWR - Edmunds Unit. Lobster Roll: Two Lights Lobster Shack Restaurant in Cape Elizabeth. Wow well done and thanks, although I'm going to have to claim Red's in Wiscassett for the lobster roll question. How much of Maine, if any, remains 'uncharted' to birders? BD: The upper reaches of the North Maine Woods and the wilder parts of Aroostook County are still mysteries. I don't know why, but almost no birders report their activities around Windham, Bridgton, Fryeburg, etc. Bethel is under explored. Interior Washington County around Grand Lake Stream needs some work. And new land trusts are springing up every day. Consider them uncharted. The lobster roll in Wiscasset may be better, but you can't beat the ambiance at Two Lights. It's fun to watch for stray alcids and pelagics while chowing down. What is left to be done on the Maine Birding Trail? The "Previous Research Experience" of Jeremiah "Jed" Hayden's UMaine Wildlife Ecology Graduate Student section makes me very jealous. He's worked with saw-whet and boreal owls in Idaho, canvasback ducks in Nevada, the transmission of avian flu among ducks in Wisconsin, piping plovers on Long Island and other adventures that most birders wish they were doing instead of being stuck in an office somewhere. From August 2004 through November 2006, Jed was in Maine researching the habits of secretive marsh birds for a Master's degree project. His project focused on long-term population trends of these birds in central and southern Maine. I asked him about his project with a focus on one particularly elusive Maine species, the Least Bittern. Which marshes were you working in and what kinds of birds were you studying? JH: I surveyed about 80 marshes (primarily freshwater) in southern and central Maine. I was re-visiting sites that had been previously surveyed in 1989-1990 or 1998-2000 to get an idea of how populations of marsh birds have changed in the last approximately twenty years. The species I was looking at were Least Bittern, American Bittern, Sora, Virginia Rail, and Pied-billed Grebe. Results have shown that Least Bitterns have decreased substantially in the number of wetlands used. The surveys I did and similar ones done by Tom Hodgman at the Maine DIFW have shown the Least Bittern to be extremely rare in Maine. In fact it was recently listed as state "endangered." The other species appear to be doing quite well. 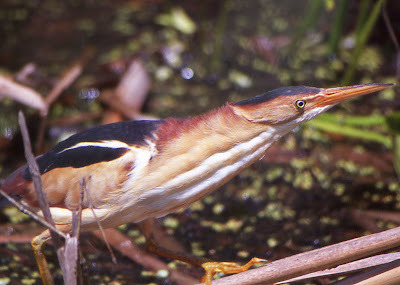 American Bitterns and Virginia Rails have increased significantly and Pied-billed Grebes and Soras have not changed much at all. It's interesting to me that Least Bitterns have decreased while American Bitterns have increased. To a birder but non-scientist, the birds seem to have very similar requirements in terms of habitat. Did you reach any conclusions as to why Least Bitterns are doing worse than their cousins? JH: Any conclusions about the Least Bittern decline at this point are conjecture. However, through a habitat analysis that is also part of my thesis (along with a lot of field observations) it appears that American Bitterns are much less strict in terms of suitable habitat they will occupy. Least Bitterns seem to be only using cattail marshes with approximately a 50:50 ratio of vegetation to open water while American Bitterns are using these marsh types as well as marshes dominated by shrubs, marshes lacking much open water, and I even noticed that they will nest in uplands adjacent to wetlands. It is certainly puzzling that the other species I studied are flourishing while Least Bitterns appear to be declining. Some of the possibilities in my opinion are: LEBI are on the edge of their range in Maine and this could be an effect of that, declines in the core population areas may be driving declines in the edges, and they migrate through and winter in areas that are still losing wetlands (eastern US coast, FL, LA, central America). I wanted to look and see if American Bitterns may be competitively excluding Least Bitterns but did not have time. It is unlikely that this is happening because they tend to occupy different niches within a wetland, but I have had American Bitterns make aggressive movements when I presented them with LBI calls (very unscientific just my few field trials). Unfortunately my funding and time ran out, but the questions of why are they declining, and is this possibly a cyclical event, need to be answered. In addition, migration routes need to be identified to ensure protection. Wow, what kinds of aggressive movements from the American Bitterns? Is this something they do with other marsh birds as well? JH: I was studying two smaller marshes where AMBI were calling and no LEBI were present. Each time I went there, I would play the LEBI call and this would prompt the AMBI to fly over and start calling right away. It would not do this for other calls (i.e. SORA, VIRA). However there were a few marshes where both species co-existed so there may not be anything to this. It would be interesting to see if marsh size affected inter-species aggression (i.e. in large marshes with plentiful resources there is no aggression, but in small marshes with limited resources the two species won't tolerate each other). I have attached a picture of LEBI I took last year. JH: With all of these marsh birds the best way to determine presence is through a standardized callback survey. We set up points approximately 200 meters apart in each marsh and perform callback surveys at each point. Surveys are done between 1/2 hour before sunrise to 3 hours after sunrise to coincide with peak calling hours for the birds. I found the LEBI to be quite aggressive when present and had them come within a few feet of the canoe. I even had a Virginia Rail come onto the canoe. Mist-netting is messy in marshes, but it does work because the birds are so aggressive when defending territories. Where in Maine (other than Scarborough Marsh) would a birder have the best chance of seeing Least Bitterns and what is the conservation status of those areas? JH: Scarborough Marsh actually isn't a good spot. They were only seen once there and likely they weren't breeding. Some of the more reliable sites are Penjajawoc, Sand Point WMA in Stockton Springs, the North end of Sabattus Pond in the cattails, Belgrade Bog, a smallish cattail marsh on the east side of 95 (200 meters away from the highway) south of Hermon Pond on Bog Rd. There are a couple more I can't remember off hand. They are mostly protected wetlands, aside from the smaller one I mentioned last which I am unsure of. What do you see as the future of Least Bitterns in Maine? Do you expect their small population to hold strong in protected areas or do you see their numbers continue to drop? JH: I don't think LEBI were ever abundant in Maine, but they seem to be at historic lows currently. I hope they will at the very least maintain the small populations we are seeing now. The key is to identify sites they are breeding in and sites that contain suitable habitat and ensure these areas are sufficiently protected from development, pollution, etc. Long-term monitoring is also essential. It is possible we are at the low point in a population cycle and the population may increase in the future, but there needs to be annual surveys done to know what is happening for sure. The other morning I got off the Metro and watched a large flock of pigeons graze lazily in Farragut Park. They were joined on the ground by bold, well-fed house sparrows and European starlings. As I watched these birds lounge through the grass I thought: where are the predators? It seems to me that cities are the perfect place for birds of prey. There is an abundance of food in pigeons and house sparrows, and there are plenty of concrete ledges for nest-building. Why, then, don't we see more birds of prey in DC? My working theory was that crowded cities don't meet the territorial needs of raptors. Birds of prey can wage some epic battles over territory (ask Martha), and perhaps cities just don't provide enough room for the birds to...wait for it...spread their wings. But I needed an expert opinion. I managed to get ahold of Mr. Brian Walton, one of America's foremost experts on birds of prey. Mr. Walton has a long history of protecting birds of prey, and has been the coordinator of the Santa Cruz Predatory Bird Research Group since 1977 and is a lecturer at the University of California - Santa Cruz. bDC: What are the territorial requirements of Peregrines? Walton: "No specific requirements, they need a nest ledge, and abundant food which seems to be occurring in virtually all major cities. In places where food is extremely abundant they may nest as close as a hundred yards apart (in Long Beach Harbor there are 6 pairs less than a mile apart), and in some places they now nest on ground (saltmarshes) or even emergent tree snags in re-growing forests to exploit abundant food in those locations. " bDC: Why more falcons haven't moved into cities like DC, despite the fact that there is an ample food source (pigeons and house sparrows by the thousands) and lots of buildings and ledges for nests? Walton:"Many places where peregrines nest in cities, the original birds were released there. In other places peregrines have moved in and I do not think anyone knows why they have moved into those cities and not others. It may be a matter of time. I would expect some of the birds that nest on bridges around DC to move into the city soon, however the amount of human activity on some buildings can limit use by falcons. There are definitely many buildings of the type that one would expect peregrines to occupy in DC. There is definitely food and other needs." "Peregrines are doing a pretty good job of occupying cities, they can because they only eat birds and bats that they catch in the air. Their prey seems to be vulnerable moving through the cities where there is no natural cover. Peregrines catch birds and bats at twilight and even after dark in city lights. Add to normal prey items is the abundant pigeon and other bird populations like sparrows, starlings and parrots. No other predatory bird can manage this lifestyle over the course of a year and most need very specific food items during the breeding season. Occasional red-tail, kestrel and in some areas merlins and coopers hawks can make a living but usually the prey for the types of other raptors is not sufficient or available in cities." "One other thing to make clear about peregrines. They are not adapting to cities. They live and hunt in the air, they roost where it is safe, the buildings or bridges are just like cliffs, and in fact there are fewer eagles and owls to harass the falcons or eat their young in the city environment. They do the exact same thing in the city as their counterparts do in the wild areas. No other raptor could do the same in the city as they do in wild areas. " So it sounds like once Peregrines and other raptors can develop appetites for city food, cities could be an ideal place for them to live. I hope that development comes sooner than later...those Farragut Park pigeons have had it too good for too long. Probably the best way to describe my uncle Pete would be to call him a 'character.' Armed with an open mind and a boisterous laugh, Pete has done more in his life than most anyone else I've ever met. Among the hats that Uncle Pete has worn since I've been around include: publisher, singer/songwriter, writer, artist, reggae band keyboardist, mystic, seller of quartz crystal, treasure hunter, cairn-creator and, when I was little, part-time babysitter. Uncle Pete is also remarkable with animals. Tripper, the dog he had when I was young, was the best-trained dog I've ever met. Pete also took in a standard poodle named Hunter that had proven too wild for my family. When Hunter bit (playfully) one of my brother's friends, Pete volunteered to take in the dog and, in no time at all, had turned the dog into one of the friendliest and most recognizable (thanks in part to the Hunter's new deadlocks) dogs in Portland, Maine. In addition to dogs, Pete has always been able to interact, mostly through call-and-response, with American Crows. Recently Pete and I exchanged emails about his relationship with crows and his insights into their social behavior. bDC: Yo, Pete. When did you first begin to understand the social behavior of crows and how did you go about first attempting to participate in their behaviors? PL: The first real knowledge of the social nature of crows came from two stories that I read when I was quite young. The first was a very touching story about a young boy in a village in Japan who was kind of a social outcast, who, during an opportunity to speak at a village gathering, imitated how the crows' calls sounded depending on what was going on. In particular I remember that he imitated how the crows cawed when a person in the village had died. It changed the villagers ideas about both the boy and the crows. I also had, as a young boy, read a short story written by the famous outdoor author, Jack London, where he detailed the social activities of a group of crows. He transcribed different crow calls onto a musical staff. Having been taught to read music, I understood the "danger" call, and I recognized it when I heard crows using it. I tried it out when there were crows around, and they would flee the area while repeating the call when I used it. The first attempt that the crows made to include me in their interactions that I really noticed was when I was about 35, when two crows flying forty or fifty feet up dive-bombed me (it was a dry run) to about eight feet above my head as I was walking through the middle of the huge empty parking lot near City Hall in downtown Portland. It seemed playful, as they were not harassing me vocally, which they do when they are upset with me. There are a few events leading up to this, and many thereafter, which serve to document the growing awareness and interactions between me and the crows, which I can expound upon later. bDC: How did you react to these birds playfully diving you? Did you feel you understood why these birds were acting this way? PL: When I got over my initial reaction, which was surprise and astonishment, I assumed it was their way of acknowledging me and welcoming me into their extended family, sort of like an fraternity initiation. It made me feel included, and special. It also made me feel happy and lucky. I've never seen or heard of that happening to anybody before. bDC: After you felt that you were initiated, how did you proceed to interact with crows? Did you continue to see the same pair from the City Hall lot or did you feel a connection with others? PL: The "initiation" encouraged me to continue to interact with them, of course. My usual method of communicating with the crows is to call to them when I see them, or use my signature piercing whistle. That's whistling with the lips drawn back and the tongue folded over, which carries for quite a ways. Honestly, I can't tell one crow from another with the exception of the head of the group, who has a distinctive halting call. He uses the call to identify himself when he wishes. I use it back to acknowledge him, or to let the other crows know that I know their group leader, or to see if he's around. They have several places they hang out in town, on top of a few different buildings. I used to be too self-conscious to talk to them in public, but once after I saw an old man calling to them I figured, hey, if he doesn't care, why should I? After that I didn't are who was around, I'd just let loose with a few caws when I saw them. Sometimes the crows would jump up in surprise but they got used to it after a while. After they learned I was being friendly and social, they would occasionally put on a show and all come fly high over me, just higher than the buildings, circling and cawing. Once it happened right in front of the police station downtown. It was a riot! Five or six crow can make quite a racket, I was very pleased. A little while before that, I had seen a young crow, too exhausted to fly anymore, kind of skid down the side of a building right on to the sidewalk. There were people walking by not seeming to notice, but his parent hid in the nearby tree so as not to draw the attention of any predator. I crossed the street and picked up the young crow, then about the size of a robin, looked him in the eyes, cawed gently to him a few times, and put him safely behind a chain-link fence onto the lawn of a church building that used to be across from the old Levinsky's clothing store on Congress St. Then I left, and cawed to his parents to say hi. This was in the springtime. Early that fall, I saw a crow sitting on the telephone pole at the same location, and, as I watched, he left his perch and flew, hovered in the air for fifteen seconds or so, right over the place I had picked up the young crow. I suddenly thought, this is the same crow I picked up, showing me proudly how well he could fly now. That was cool! It could have been his parents that had dive-bombed me as a way of saying "thanks!". Once as I walked by a group of high-school students, one of the students cawed. I think I was being teased because I had been noticed talking to the crows in public. I thought it was funny! The main times I would interact with the crows was when I was walking my dog(s) in the areas away from the inner city where there were a lot more trees and open spaces. bDC: How did the crows react to Tripper and Hunter? PL: I don't know exactly how the crows reacted to the dogs. I think it was more a way that the crows identified me, because I usually had one dog or the other, or for a while, both of them, with me. But also they could see that I had dominion over the dogs, that they obeyed me, so the crows had some idea of our relationship. Tripper (my first dog, a mid-sized terrier mix) loved to speak with a loud "ROOOOOoooo!" anytime I asked him to. He was full of enthusiasm that way. And any time I noticed crows around when I was out walking, I would have him speak. I think the crows took it as a greeting. I hadn't yet started talking to them directly yet. I think the crows liked Crow-dog ( a standard poodle) because he was black, like the crows. His name was "Hunter" when I got him, when he was three-and-a-half years old. But he was so independent and headstrong that I couldn't scream "Hunter" fast enough before he got into mischief..
One day I had brought a crow skull and some bones down from up the hill under an apple tree where I had placed a dead crow I'd found on the road, a couple of years before. I had the skull and bones by the front door with intentions of making some kind of artistic arrangement of them on a board to hang on the wall or something. The next morning, after I had let Hunter out, I noticed the bones were gone. He'd eaten them. Just then a crow flew very low over my backyard, cawing. That's when I named him "Crow". It seemed as if the crow knew what had happened. So Crow was actually part crow, seeing as the bones he ate went into his bones, most likely. bDC: What are your interactions with crows like now? Do you hope to communicate more closely with them as time goes on? PL: My interactions with the crows are generally less intense than they were in the past. It has settled into a fairly predictable routine. For example, as I crossed the big parking lot close to City Hall yesterday, I gave a loud whistle, and a couple of crows who had been in Lincoln Park flew out and lit on the top of Franklin Towers, which is the tallest building in the area, overlooking that section of the city. From there one of them started calling down to me, and I responded in kind. I stopped walking for a few minutes to watch them and "hang out", then continued my trip to the post office. It's the same way I interact with my neighbors or acquaintances. I don't really know how I could communicate with them more closely, but if I could, I would. For now it seems enough for both of us to enjoy mutual recognition and appreciation of each other's presence in the world. Sometimes I wonder about re-incarnation, thinking that it might be cool to come back as a crow. But I don't know about having to sit in a tree by the side of the highway waiting for a car to run over a squirrel. Anyone who uses a computer to find information on birds or birding (including reading this blog) owes a lot to Norm Saunders. For nearly 20 years Norm and his wife Fran have been dispensing information on bird sightings, trips and news in the DC area using digital technology. It all started in 1987 when Norm (I tried calling him Mr. Saunders but he wouldn't have it) created The Osprey's Nest (TON), a computer bulletin board system that allowed users to telephone in and listen to messages posted by other callers. It was the first system of its kind in the country dedicated to birding and began what must be called a revolution in birding, where sightings from all over the country can be shared almost instantly through a listserv like Norm's successor to TON, MDOsprey. I recently asked Norm a few questions about the early days of digital birding, and what the use of digital technology has meant, and will mean, to birdwatching. bDC: In terms of reporting and sharing sightings, what options were available to a DC-area birder in the days before the start of TON? NS: There was always the MD Ornithological Society, with its many chapters (most of which maintain loosely-defined phone trees to notify folks of good sightings) and the Northern Virginia Chapter of the Virginia Society of Ornithology (ditto). But if you were a serious up-and-coming birder there was really only one source: the Audubon Naturalist Society’s Voice of the Naturalist. When I was getting started in birding in 1981, Claudia Wilds was compiling and recording this tape. It was released at 10:00 am every Tuesday morning from Woodend, the ANS Headquarters in Bethesda. One had to make the call (usually more than once) and then take notes like crazy to make sure every last bit of information was wrung out of the week’s recording. Later, as I recall, Claudia had help from Erika Wilson (now retired and living in Arizona), and now a number of people still take on this burdensome task. It was *THE* way for birders who weren’t “connected” to get the necessary information about the really good sightings of the week. Of course the very best way to get the timeliest information is to be part of the inner circle of birding. There is still a loosely-defined group of 25-30 birders who get the news before everyone else of a rare bird and who get invitations to see birds that are never reported in a public forum, usually because they are on private property or located where hordes of birders simply wouldn’t be welcomed. Most of the birders out there looking for news of good birds have neither the time nor the skills to penetrate this coterie. I suppose this group is necessary to insure that really rare birds get properly validated and recorded, but it’s a fact of life about birding that has never sat well with me and one of the primary reasons I got involved with providing a public birding forum. bDC: So, once you recognized the need for a better system of reporting birds, how did you chose a computer bulletin board system (BBS)? Home computers and the internet were certainly not as prevalent as they are today, was finding a 'market' for TON a problem? NS: Oh, that was the easy part. I'm an economist by trade and I always felt the best part about this job was the chance to fool around with the heavy iron of the big mainframes. So I was a sucker for personal computers when they first started appearing in the early 1980s. I wanted to know them inside and out and I wanted to push them to their limits. Shortly after buying my Kaypro II I read an article about BBS's where I could talk to other people and get free software and generally hang out with other computer weenies. I had to teach myself enough Z80 assembly language to write a simple download routine for the Kaypro. That enabled me to get my first real communications package, and that opened up the whole world of bulletin boards. After a few years searching for other online birders, I realized that there were no birding-related bulletin boards (keep in mind that this was well before a viable, useful internet had arrived) so the idea of BEING the first hit me between the eyes like a freight train (how's that for a mixed metaphor?). I wanted to aim at people from the DC area, primarily because it was a local call for them to reach The Osprey's Nest (TON), the bulletin board I began in 1987. Getting the word out was simple--I was a regular BBS'er on about 4 or 5 local bulletin boards, so I posted messages there letting people know about TON. I started to get new users almost immediately and by the end of the first few months we had about 50 or so periodic users. After that it grew slowly but steadily until we peaked out at about 150 or so local birders. Even though we had had over 2000 individuals call in from all over the U.S. to see what it was about, it wasn't practical for most of these folks to call often because of long-distance charges. This was the great limiting factor of BBS communications. Nonetheless, it gave a lot of locals a taste for what was possible. Many of these early subscribers remain my friends to this day! bDC: For those of us who aren't familiar with a BBS, can you explain essentially how it worked? NS: An individual would call the phone number (a dedicated telephone line) and my computer/modem would answer the phone and query the caller for their name and password. If they were a new user they would have to go through a registration phase where I gathered information about their name, address, phone, e-mail, etc. Once past the login process the user could elect to go to the message section of the bulletin board or to the files section. The message section was a sequential set of messages posted by other users, just like a listserv, but without the re-distribution to all subscribers. People would post sightings reports, ask questions about equipment, flame some other user (which I tried to keep to a minimum), etc. You know, all the stuff that goes on in listservs and, I suppose, in blogs today. The file section contained material I thought would be of interest to birders and other amateur naturalists. I posted weekly transcripts of the Voice of the Naturalist, of Armas Hill's Philadelphia Bird Line, of the weekly Cape May Bird Tape, etc. There was really quite an accumulation of freeware software, birding checklists, transcripts, and other goodies, including field trips scheduled from a variety of around-DC organizations, birding clubs, and the like. I put up most of this but a significant proportion came from users of the BBS. bDC: The internet has allowed people who share an interest but live far apart to create a sense of community. TON and the listservs that came in its wake have certainly had the same effect. Do you think that birding is "better" now? NS: Well, yes! We hear of sightings from around the state almost instantaneously now. We meet like-minded folks on-line and that leads to widespread networks of birders of all skill levels around the state. This mix of expertise flattens the learning curve and eases the formation of mentoring relationships. It is this mentoring which has led to the current bunch of "young Turks" now moving up the ladder to the top levels of birding in Maryland and elsewhere. People get over the many beginner's mistakes faster and amidst, generally, a supportive and well-informed commentary. bDC: Are there people, perhaps from the group of elites you mentioned before, who don't approve of the access amateur birders have? NS: There will always be a few, I suppose, who enjoy that sense of being in the inner sanctum and who resent the wide distribution bird sightings get today. I know a lot of birders in Maryland though and I can't really think of any who don't see forums such as MDOsprey as a tremendous boon to this insane fascination with birds that we share with each other. bDC: Where do you see the future of digital birding? NS: Cornell Labs and others are moving more toward online electronic reporting systems for their various citizen science exercises. To the extent that this gets more people involved and aware of environmental issues, I applaud their efforts. To the extent that people use this data to draw their own conclusions about birding issues, I am increasingly concerned. However the use of electronic media evolves, though, it will continue to be with us and we should all work to make it a valuable adjunct to the spread of birding knowledge.